The scientific program will start on Monday, June 23, 2014, but the social program starts already on Sunday June 22 with the welcome dinner. Recommended arrival in Trento is therefore Sunday, June 22. The meeting ends on Friday, June 27. Dinner will be arranged on Friday night for those that stay until Saturday. In the spirit of ECT* we aim to organize this workshop with ample time for discussions on the topics presented by the speakers. We ask the speakers to prepare their contributions with that objective in mind, and to keep the amount of presented material down. Instead, discussions during and after the presentations will be highly encouraged and also integrated into the time schedule. In these overviews, we ask the speakers to spend a significant fraction of their presentation on giving an introduction to that particular field and, in particular, to the physics of resonances and non-hermitian quantum mechanics (NHQM). This should serve as an introduction for the non-experts in the audience. 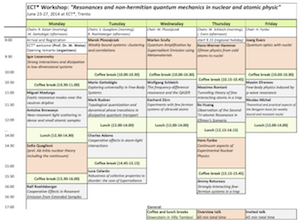 The other invited talks will focus on recent developments and hot topics.